World copper prices are tumbling again and fingers are pointing at China’s ailing financial system. China is sitting upon huge stockpiles of copper that it uses not as a commodity but a financial instrument. This copper scheme that has seen price drop forty to fifty cents a pound since January is a good example of the frenetic intemperance of certain reckless sectors of the economy that throw off restraint to the detriment of the whole market. Observers in the global copper market report that much of the metal filling up Chinese warehouses is not finding its way into products. Some believe that as much as a third to a half of warehoused copper (40% of world supply) is entangled in financing dealings. With Chinese banks tightening the supply of credit, traders are resorting to a shadow banking system which accepts copper as collateral for cheap loans. This cheap money is in turn leveraged and invested in higher-yielding assets for large profits. The result is frenzied activity around the metal that is turning markets upside down. 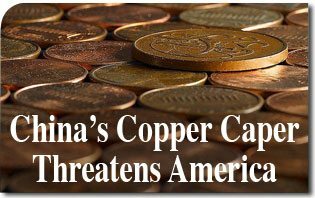 Economists now believe that Chinese rush for cheap money through copper could lead to a downward spiral. As even China’s shadow banks have started to tighten their credit lines, huge unused inventories could depress prices, cool demand and heighten risks. The volatility around this important metal creates a climate of uncertainty and turmoil that harms business not only in China but all over the world. Such financial shenanigans are affecting American business since on any given dayAmerica manufacturers and distributors of copper wire and cable, for example, have inventory levels approaching $1 billion dollars. The key to profitability and productivity is the stability of copper prices which generally should not fluctuate significantly. This allows wire and cable companies to manage inventories utilizing a variety of copper strategies based on the metal’s price at the time of order fulfillment. Thus, in a truly free market, business can generally deal with minor fluctuations based on normal market conditions. However, if copper becomes unstable with volatile drops over a succession of days, the users of copper products put a halt on purchases until there is some stabilization. In addition, high volume purchasers of copper, such as electrical contracting companies, are often force to sell low with great loss or ‘write down’ inventory which, of course, has a negative impact on profitability. Contractors, depending on the agreements they have with their clients could also ‘lose’ if they have a metals clause in their contracts. Finally, copper de-escalation can have dramatic affects on the workforce; including lay-offs and reductions in income. All of these effects could affect American business because Chinese speculators are using natural resources as bargaining chips for high-risk leveraging. The last copper crash in late 2008 is a good example of just how devastating a copper crunch can be. At that time, copper plummeted from its near $4.00/lb price to well below the $2.00/lb. range resulting in huge losses. The industry has still not recovered from the market’s collapse even after six years. While company profits continue to grow and “prosper,” a large part of the growth is built around cost cutting and reductions rather than product growth and innovation. Today, most companies focus on “stripping out cost” from their transactions by outsourcing processes and services or rewriting specifications that allow for cheaper less reliable raw materials to be used in manufacturing. Many companies have arrived at the conclusion that most market sizes are fixed and have little to no growth in their future leaving large corporations to execute strategies of growth by acquisition rather than market share gain. As another copper crash could loom on the horizon, every American company that utilizes copper at any level is put at risk. Given the present instability of China’s economy and its lack of a real rule of law, this is just one of many areas of concern. A steady stream of news reports tell of similar market capers, ghost cities, a devalued yuan plus faltering financial data, all of which is setting off alarms. China’s juiced up system of economic expansion that runs on frenetic intemperance is slowing down. The copper caper may be just the beginning.